We have had heaps of requests over the past couple of years for the Pot Holder Pattern (in a tutorial format) for our Heart Pot Holder. We finally got around to it, just in time for this years Valentines Day. We have modified the pot holder pattern slightly and have made it using some pretty Pirouette Fabrics from XO Gigi Fabrics. 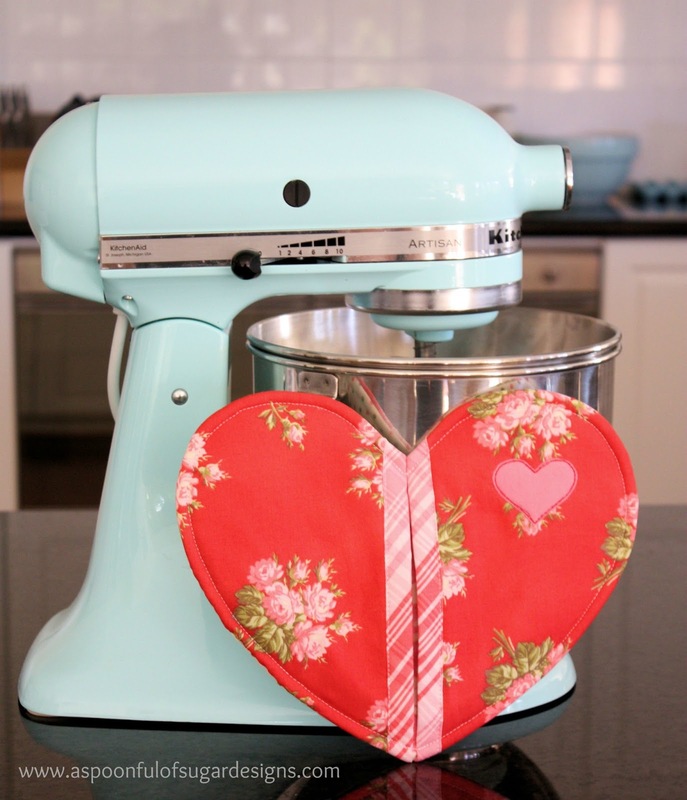 It will be perfect when baking some Valentine treats and throughout the year. The pattern features a little felt appliquéd heart. 2 heart in quilt batting. Cut one of these hearts in half as pictured below. Cut two rectangles, measuring 2 1/4 x 8 inches) from Fabric 4 for the binding on the front of the pot holder. 2. Press the two red hearts in half with the wrong sides facing. Place a piece of batting inside each red heart (using the batting heart that has been cut in half). To create a binding strip, press the fabric rectangles in half lengthwise. Unfold, and fold the edges into the centre, and press. Fold in half so that you have a binding strip that measures 8 inches x 9/16 inch. 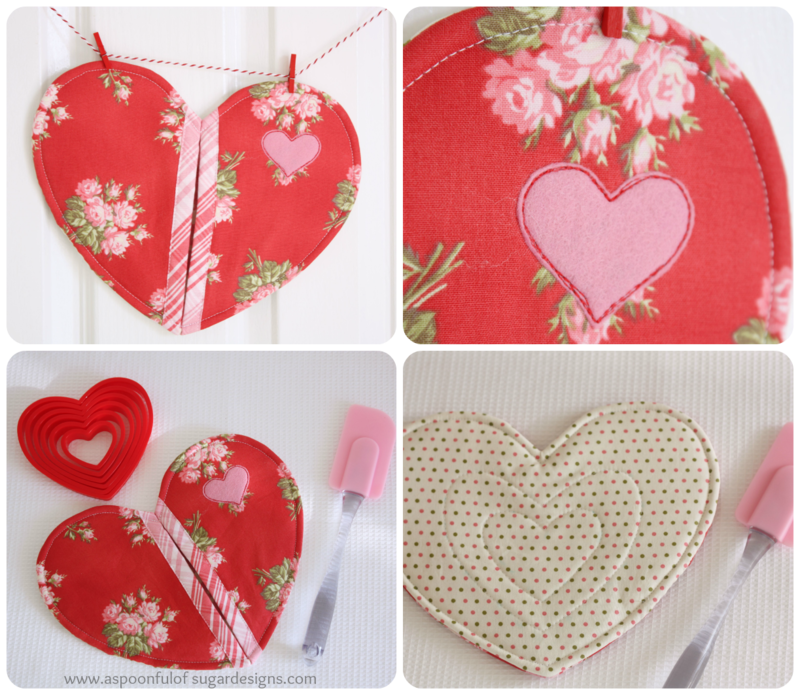 Pin the binding strip to the inside edges of the red hearts and stitch in place. Trim the ends of the binding strip. Pin the felt heart in position. Stitch around the outside of the heart, 3 times in red cotton. Pull loose threads to the underside and tie off. 3. Position the red hearts on top of the pot holder lining, and pin in place. Stitch around the outside of the pot holder using a basting stitch and a scant seam allowance. Press. 4. Trace the quilting pattern onto the back of the pot holder using a water soluble pen. 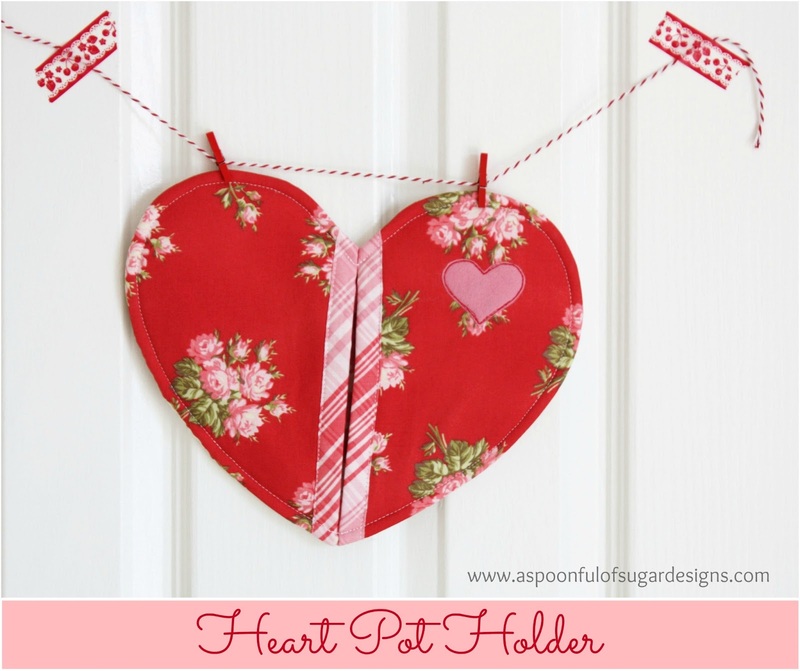 Pin the back of the pot holder to the insul bright and batting hearts. Quilt the heart design on the pot holder back. Remove the water soluble pen markings. 5. Pin the pot holder back and front together with the right sides facing. Stitch around the outside of the pot holder leaving a 3 inch gap on on side for turning. Clip curves. Turn the pot holder out the right way through the opening. Hand stitch the opening closed using a ladder stitch. Press. 6. Top stitch around the outside of the pot holder using a 1/4 inch seam allowance. Press. The heart pot holder pattern is suitable for beginner sewers and can be made in approximately 2 hours. 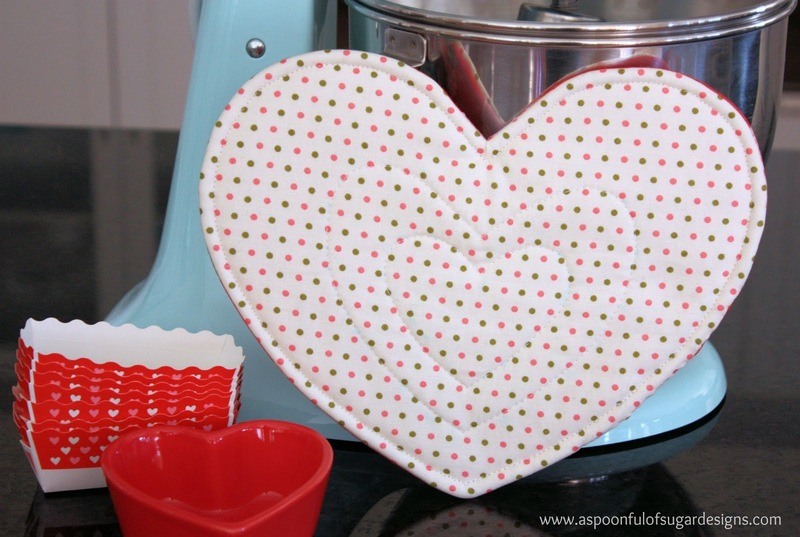 You can check out our original pot holder on our Valentines Pot Holder post. Thanks to our lovely reader Kathryn Humes who drew up the template for us. 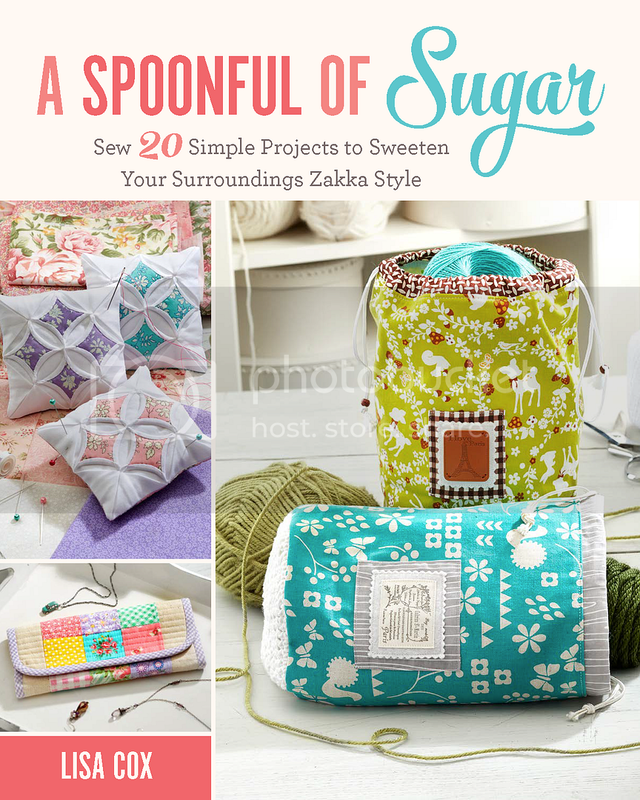 If you enjoyed this tutorial, check out our book – A Spoonful of Sugar: Sew 20 Simple Projects to Sweeten Your Surroundings Zakka Style. For your daily sugar fix you can subscribe or follow us on instagram, facebook, pinterest, twitter, and google plus. I love that heart it’s easy to make Thanks again . Great tutorial und thank you so much for those lovelys pot holder pattern! Thanks so MUCH! 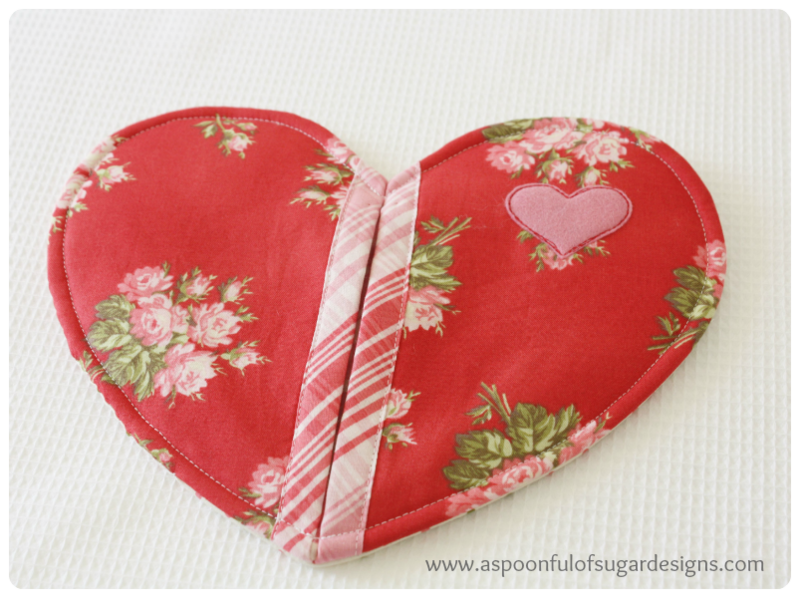 I’ve been wanting to make a heart potholder for some time – with your great tutorial, I think the time has come! Will share this for sure! Thanks for this tutorial. I’ve wanted to make heart potholders for ages but could only find ones with binding around the heart. I’m not keen on binding small fiddly objects so this one is a winner for me. Tqvm for this comprehensive tutorial. I’l make this lovely pot holder for my craft gift exchange this chinese New Year. Warmest regard from Malaysia. I love your blog a lot. tqvm for being a great inspiration. What a lovely idea for valentine´s day (and very nice photos), thanks for sharing. Thank you! What a well done tutorial! I found your blog through BadAss Quilters Society on Facebook. Now to see if I can beat the estimated time for completion! I just love this! 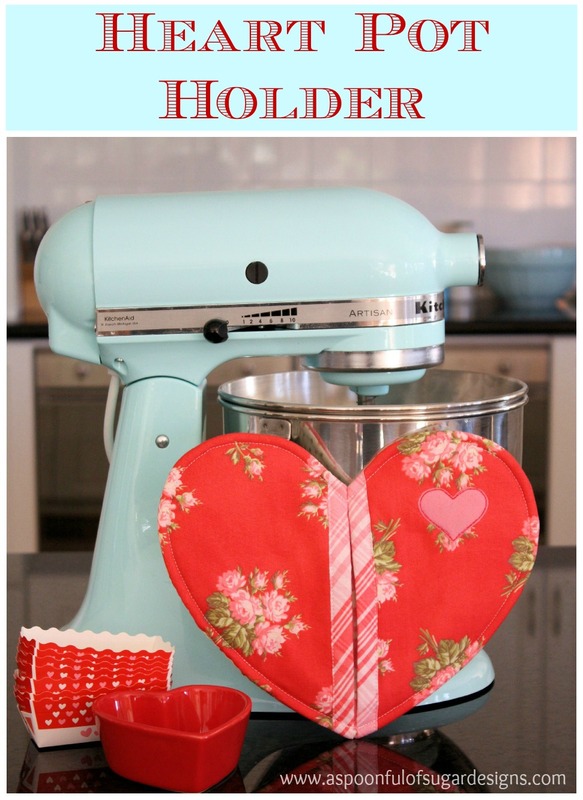 What a sweet potholder and wonderful tutorial. I’ll be pinning and sharing this! Sooooo dang cute!!! I wanna make one tonight. Thanks for sharing. OMG, I have never seen anything like this ADORABLE! Thank you for the tutorial! Thanks so much for the pattern and tutorial! I’m making some today! Thank you so much!! Love the way it comes together! Made one today, and it is very sweet – almost too pretty to use 🙂 only problem I had was what seam allowance to use in step 5? I used 1/4 inch but it was possibly a little small given all the layers. Thanks for a quick satisfying project just in time for Valentine’s day. I found this through craftgossip. Thank you very much! That’s a lovely and quick project. Very, very cute Lisa. Thanks for the tutorial! I love this project. Unfortunately your links for the patterns are not working. Could you re-post the links? I really want to make these cute pot holders! I want to make this but the template is not coming up for me. Any suggestions? thanks for this tute ! just what I was looking for ; I need potholders and this is adorable ! does it matter which way the insul brite goes ? I have some but not the paper that came with it ! thanks again ! The link works now. Thanks!! Thanks for your amazing blog and this fun pattern. I love it and have made one and have 9 more in the process. I plan on giving them to a few of the teachers I work with and to a few of my dear friends. I wish I had time to make one for everyone I know. They are going to LOVE them. Thanks again! You have such wonderful posts and I enjoy following you! Thank you for sharing this great tutorial. I made one with just two fabrics and it turned out very nice. If you plan it a little differently, you can end up with the opening on the inside I think and then your slip stitching won’t be noticeable. I say this because that’s usually the low point of any project I do. I’ll give mine to my daughter for Valentine’s Day. Thank you again! Love this! Now to find the perfect material. and I forgot to say popping over from Blogs and PR for #TUST. Thanks for linking up. This is FANTASTIC! So darn cute! I want to make them even though Valentines day will be over before I get to it! Pinned, stumbled and working on some of my own hearts! Another gorgeous project! You guys are so clever! Thanks for sharing. I have posted about your tutorial on Freebies for Crafters. Love the potholder, but having problems downloading the pattern. Have you had anyone else having problems with this? I will try again. Thank you & appreciate you taking the time to respond! My kids wanted more of these heart potholders like I made years ago. Thank goodness I don’t have to fight the binding this time. Thanks for this “recipe”. This pattern is so much easier that the type with binding! Hi..love the potholder, but can’t get the template to open so I can print it..just a blank! I don’t know what I am doing wrong! Not sure why it isn’t working for you – it is working this end. I’ll email it to you. I love this, too, but cannot open the template. When I try on iPad, it is blank and the title line says (Template 2.pdf) with a padlock symbol. I also tried to open it windows on my laptop, I signed into google, but the page was so large, it only showed 1/2 of the heart when i clicked on print preview. i could not get it to show the entire template even when i put it at 100% or even 50%. Sorry. Sorry to hear about that Brenda – it works well from our end and we have tried it on a few different computers and it works well/ I will email it to you. Could you email me the template. Iam planning on doing this for a homeschool project on Friday and don’t want to run into problems printing it. I read some of the post where others had problems. Also I am not familiar with the insul bright. Is it the Mylar poly or the needle punch? Thanks for your time and for the great idea. I think the girls will love it!! How fun that you are teaching this to your homeschool children. The link is working perfectly well. I have also added the pdf file directly into the post (under the materials list) in case anyone is having trouble with the link to google docs. Thanks for your work! I linked your Tutorial in my blog here: http://nur-noch.blogspot.de/2014/07/wenn-ein-ofenhandschuh-und-ein.html#more (in german). I wrote a post about sewing pot holders and told everyone about this tutorial+pattern. Thanks so much Ronja! Have a wonderful weekend. We would love to use this fabulous tutorial on our blog – can we have your permission? All attributes and links go to a spoon full of sugar! Hi Brittany – You are welcome to use one image from the post with a link to our site. So many great projects and ideas here….LOVE IT! Hi. I love this pot holder and the tutorial is great only i don’t understand where the pink felt goes? It says pin into place but I’m not sure what to pin it to. I feel like i must be missing something because nobody else has asked about it. Am i just not getting it or is there something elusive about the pink felt?